Formula futuristic inserted between sheets of Kevlar. The result, amazingly. A revolutionary new findings in the military is being developed in England. 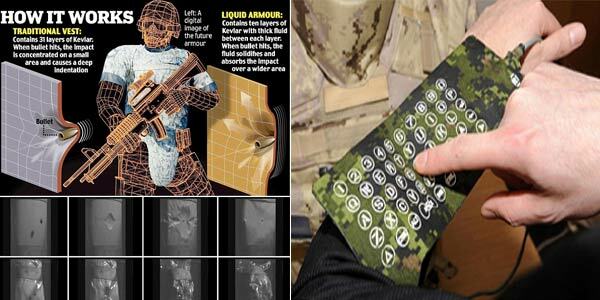 The shape, advanced bulletproof armor that is expected to save the lives of soldiers in war medang. Not the usual suit of armor, rather than made of solid material, is made from a kind of liquid. Scientists have created a top-secret substance that can absorb the power of enemy fire or shrapnel. This substance will thicken and harden as the bullet hit the mark. British defense officials believe, this dress will be more lightweight, flexible, and offer greater protection to soldiers on the battlefield. "Clothes liquid wars" high-tech is showcased in a military conference in London, alongside a variety of gadgets a la James Bond. Researchers have included a futuristic formula, which can thicken the liquid, between the sheets of Kevlar - a synthetic fiber material that bulletproof vests strength five times that of steel - to produce a super armor. Although called a liquid, molecules secret scientists who developed the form of a custard-like, a kind of pudding, which is relatively solid and thicker than ordinary liquids. 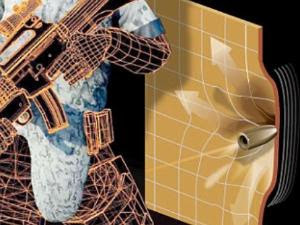 With this material, military experts say, heavy armor produced only half the usual heavy bulletproof vest, which allows soldiers to maneuver more freely. 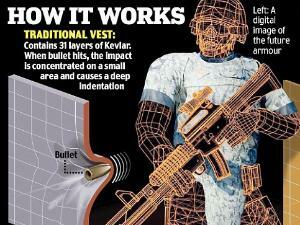 Currently soldiers wearing heavy body armor made of ceramic plates and Kevlar lining. Besides weight, the clothes certainly uncomfortably hot war zones like Afghanistan that can reach 50 degrees Celsius. The technology was developed by a team of scientists and security equipment company BAe Systems in Filton, Bristol. The scientists tested the superiority of the material by firing bullets from a 9 millimeter caliber handgun to the 31 layers of Kevlar, compared with 10 layers of Kevlar combined with the super agent. The result, when exposed to liquid armor projectiles, the impact is distributed in a larger area. This will reduce the possibility of soldiers injured or killed by the force of a bullet because it is not concentrated in one small area. Meanwhile, the traditional protective clothing has side effects: cause bruising, fractured ribs, and even damage to internal organs. BAE Systems will develop these sophisticated perng clothes that can withstand the power of the heavier weapons, including AK47 assault rifle used by the Taliban. The manufacturers believe the army could use a new protective vest in two years. "There are quite a lot of capital from the Department of Defense. We hope this could soon be used in front-line soldiers," said Nick Haigh, a spokesman for BAe Systems, as published the Daily Mail, January 13, 2011. "Traditional protective Kevlar vests are very effective but too heavy and bulky. If we are able to reduce the burden for soldiers, they will work more effectively."